Front row (from left to right): NASA astronaut Mike Fossum, Russian cosmonaut Sergei Volkov and Japanese astronaut Satoshi Furukawa. 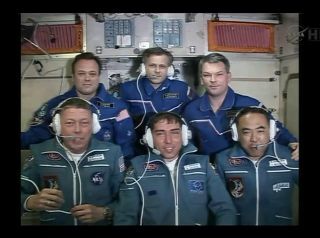 Back row (left to right): NASA astronaut Ron Garan and Russian cosmonauts Andrey Borisenko and Alexander Samokutyaev. The space station's Expedition 28 crew receive well-wishes from Russian Mission Control in Moscow after Fossum, Volkov and Furukawa successfully docked to the station in their Soyuz spacecraft on June 9, 2011. The six astronauts aboard the International Space Station will enjoy a long Labor Day weekend — the last extended break for three of them before they head back to Earth on Sept. 15. The space station will do a bit of routine maintenance and housecleaning work on Saturday (Sept. 3), NASA spokesman Kelly Humphries said. But other than that, the astronauts will have a chance to put their feet up for a spell, or catch up on some science work if need be. Three astronauts — American Ron Garan and Russians Andrey Borisenko and Alexander Samokutyaev — are slated to leave the space station on Sept. 15. The three days off may be especially sweet for them, giving the spaceflyers a chance to say goodbye to the orbiting lab. "Ron and his colleagues are going to get a three-day weekend to enjoy being in space one last time, before they do the final preparations and pack up to come home," Humphries said. Garan, Borisenko and Samokutyaev arrived at the station on April 6. They were originally slated to leave on Sept. 8, but last week's crash of Russia's unmanned Progress 44 cargo ship delayed their departure. The Progress was doomed by a problem with its Soyuz rocket, which is very similar to the rocket the Russians use to launch crews to the space station. No astronauts will launch on a Soyuz until the issue is identified and fixed, NASA officials have said. Russian engineers are making progress in their investigation. They've traced the source of the failure to a malfunction in the gas generator in the Soyuz’s third-stage engine, Russian officials announced earlier this week. The station's other three astronauts — American Mike Fossum, Russian Sergei Volkov and Japan's Satoshi Furukawa — are scheduled to come home in mid-November. After the retirement of NASA's space shuttle fleet in July, the Soyuz is the only way to take astronauts to orbit. If it's not back up and running by mid-November, the space station could be unmanned for the first time in more than 10 years. And that's part of the reason NASA decided to delay the departure of Garan, Borisenko and Samokutyaev. Keeping them around for even one additional week will allow the crew to get more science work done, which could be invaluable if the station goes to a skeleton crew of three or is unmanned altogether for a spell, NASA officials have said. The space station could survive just fine without a crew for a while, officials have said. Controllers on the ground can move it out of the way of potentially dangerous space debris, and its propellant can be topped up by robotic spacecraft. However, having no crew aboard means any problems that crop up aboard the station would likely not get fixed, making flying a more risky proposition. And having anything less than a full crew of six astronauts would cut back on the scientific research that can be done on the orbiting lab.